Hello! My name is Jose Estrada. I played violin for 4 years at Plano East Senior High, and then after leaving it behind, I picked up the guitar for the past 8 years. Guitar has been one of my biggest passions, mainly electric, but I also play acoustic and bass guitar! 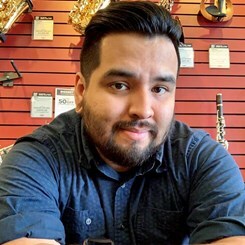 I love music, and I'm here to help with all your combo instrument needs!